Max Scurlock is a second-year graduate student pursuing an M.A. of Arab Studies. Max is a 2018 recipient of the Critical Language Scholarship. Last summer, I had the great fortune to travel to Tajikistan and study Persian through a Critical Language Scholarship (CLS), an award sponsored by the U.S. Department of State’s Bureau of Educational and Cultural Affairs. CLS programs allow American undergraduate and graduate students to study – with full funding – one of 15 languages deemed critical to U.S. national security at various international destinations. First, some context for my own experience. Having studied Arabic at Ohio State, my undergraduate institution, I decided to take Persian during my senior year. In addition to the obvious geographical linkages between Arabic and Persian-speaking countries, the two languages share a tremendous amount of vocabulary and roots (although from a grammatical perspective they are structurally dissimilar – Persian is far easier for native English speakers). Most U.S. institutions, Georgetown included, teach Farsi, the variety of Persian spoken in Iran. Most people in Afghanistan speak Dari, another variety, and most in Tajikistan speak a third, known as Tajik. There are also some Persian speakers in Uzbekistan, notably in the ancient Silk Road cities of Samarqand and Bukhara. I discovered upon arriving in Dushanbe – Tajikistan’s capital city and our home base during the summer – that Tajik varies considerably from Iranian Persian/Farsi, possessing heavy Russian influences. This is largely a result of Tajikistan’s incorporation into the Soviet Union in the 1920s. We primarily studied Iranian Persian but took a few Tajik classes to assist in local communication. 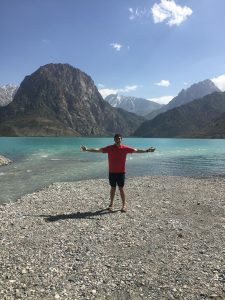 My experience in Tajikistan was uniformly delightful – as much as I enjoy Georgetown and the D.C. area, I was far from ready to leave after our program expired. Having previously travelled in the Middle East and North Africa, I quickly adapted to life in Tajikistan, though not without confronting the usual cultural hurdles. Each student in my program was assigned host families, with whom we conversed, ate, and explored Dushanbe. My host family experience was excellent – speaking little-to-no English or even Farsi, they remained exceedingly patient in conversational situations, as I was quite out of practice when I arrived (I did not take Persian during my first year at Georgetown as I was finishing Arabic requirements). I tremendously improved my Persian while in Tajikistan, thanks to the support of several dedicated language professors, CLS staff members, and a local Tajik language partner. I also developed lasting friendships and professional relationships with several of my fellow CLS students. We were fortunate enough to travel and camp extensively throughout Tajikistan, experiencing what may be the most beautiful country I have ever visited. Central Asia, which includes Tajikistan and four other former Soviet republics, is a fascinating and under-researched region. Central Asia since 1991 has experienced the rise of authoritarian rule, civil wars, and poor intraregional diplomatic relations. The latter has significantly hindered the Central Asian states, which had reaped the benefits of economic interdependence during the USSR period. Religious extremism has also emerged in the region. Substantial numbers of Tajiks have travelled to fight in Syria or pledged allegiance to extremist groups. A week or so before our departure, Islamic State supporters killed multiple American and European tourists, including two Georgetown alumni. Fringe American news sources seized upon this incident to declare Tajikistan, among other things, “ISIS territory”. This betrays ignorance about the country and the region – such incidents are rare and Tajiks are extremely welcoming towards visitors. The U.S. government and citizenry should continue supporting exchange programs and responsible economic development policies in Tajikistan and elsewhere. These initiatives, not xenophobia or isolationism, advance American interests while improving the lives of countless others. Upon returning to Georgetown, I began my second year as a master’s student in Arab Studies and enrolled in third-level advanced Persian courses. Georgetown’s Persian department is well-run and the faculty is consistently dedicated to student success. I encourage fellow students with interests in the Middle East or Central Asia – especially those who may not possess the time to master Arabic – to consider enrolling in Persian and to apply for a CLS award. No language is easy, but in my experience, Persian is quite straightforward when compared to Arabic or Spanish. I am extremely fortunate to have participated in the CLS program and have profited personally and professionally as a result. I encourage others to seek the challenge of learning a second language and adapting to an unfamiliar international living situation – you will not regret it! Max in Tajikistan, standing in front of a mountainous landscape.